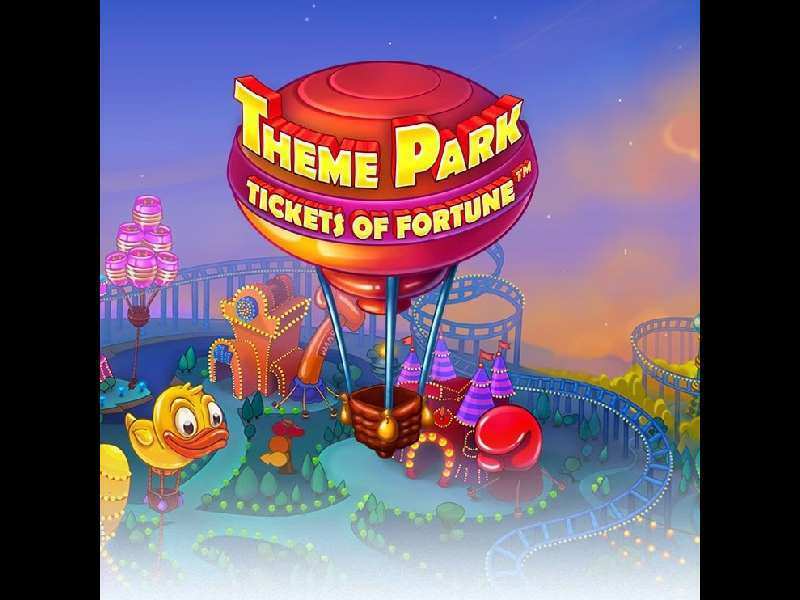 Theme Park: Tickets of Fortune is a typical NetEnt creation games, which is based on the concept of theme parks, and vows the players to take them to their childhood days. The game slot is fun and innovative, and the slot design comes up with amazing symbols, fun-filled bonus game offerings and many more. This game can be played in casinos across UK or any other countries, where NetEnt’s games are supported. The game can be played for real money and requires no download or registration of any sorts. For the players opting to play free Theme Park: Tickets of Fortune casino slot machine game, the chance of earning real money is minimal. Theme Park: Tickets of Fortune is a game, which contains 5 reels and 15 symbols in the game screen. The winning line count is 25 and it is not fixed alike many other slot games. Players can invest and put equal bets per each of the 25 lines. The game also permits to wage up 10 coins of values of each lines as 0.01, 0.02, 0.05, 0.10, 0.20, 0.50 and 1 dollar as the maximum limit. The game vaunts different sorts of symbols ranging from ordinary to special symbols. The basic symbol in the game ensures a win on forming a set of same symbols at the active line. The formation is checked from left reel and it will continue to traverse from the first chosen reel. The amount of payoff clearly depends on the bet per line ratio and the index of already made combinations, which might be from 2X to 400X. Both these values are then multiplied to ensure final payoffs. On the occasion of the multiplied combinations formed by outcomes of a single spin, the entire sets of credits are then summarized. The game doesn’t contain a separate gambling feature. Winnings are then instantly transferred to the account of the player. Wilds: Wild Symbol in the game is distinguished by a rollercoaster icon. The Wilds initially appears at three central reels and then drops in stacks along with leaving a chance to fill the entire reel set. Wilds in the game doesn’t gives away any sort of payoffs, but has the ability to replace any other lower valued elements except for the scatters and bonus symbols. Scatter: An icon of Golden tickets denotes Scatter Symbol in the game when the symbol appears in the set of last three reels. When it drops anywhere in the last three reels, a new feature called as Theme Park Ticket gets activated then and there on the screen. Claw: The symbol of a mechanical claw symbol is only available at the fifth reel. It activates the bonus rounds when gets triggered. Bonus: The bonus symbol is denoted by a fortune wheel, and it appears only on the fifth reel. This activates the theme park bonus wheel feature at any place in the reel. Can Bag: The players require hitting three towers made of cans. The maximum earnings from this round are 864 bets. Punch Bag: The punch bag game requires the players to hit the punch bag and to check out the amount of payoffs. The range varies between 2 and 25 total bets. Sledge Hammer: A simple hit on the anvil with a hammer, and the players could end up earning 1 to 100 bets. Skee Ball: The players require rolling up 5 balls into the special hols. On every next attempt, there is a decent payout. Fishing: Take five fishes out of a swimming pool to earn bets from range 2 to 25. A possibility to earn an extra attempt arises. Duck Shoot: The players are required to have 5 shots at the target, which will be in the shape of a duck. Each shot has various bet rewards and bonuses. Theme Park: Tickets of Fortune is a game best known for its brilliant set of bonus features, which has ever since drew the players from worldwide. This NetEnt’s developed slot machine game has won accolades and praises among new players, who prefer playing for either minimal wages or even for free, have lauded the game’s winning structure largely. 0 responses to "Theme Park: Tickets of Fortune Slot"